Many applications like DSP benefit from blocks of RAM distributed in the array. Of course it is possible to attach RAM to the external I/O pins of the array. You can also have array embedded within the array! Each EFLX4K core has >1000 interface pins. When multiple cores are arrayed, the pins that face inward are available to control block any kind of RAM using our novel RAMLinx™ interconnect. Any amount and kind of RAM can be inserted between cores: single or dual port, x16/x32/x64/..., ECC/parity/neither, and optional MBIST. The EFLX compiler can map your RTL onto the RAM you want to configure in the EFLX array (and to RAM external to the array). 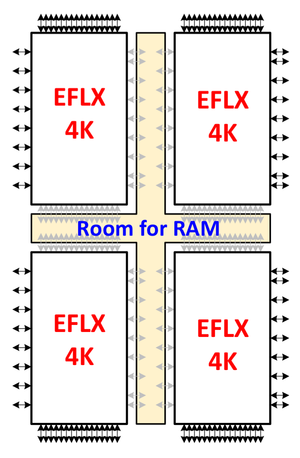 A specific example is shown below for our soon-to-be-taped-out 28nm validation chip: here we have four EFLX cores with dual port RAM embedded horizontally and vertically, a total of 108Kbits. This particular example was chosen to provide BRAM of the sort found in FPGAs in the same rough ratio of RAM:Logic as typically found in FPGAs -- customers have requested this because they find this ratio of logic-to-RAM is best for many accelerator algorithms they wish to use on eFPGA.